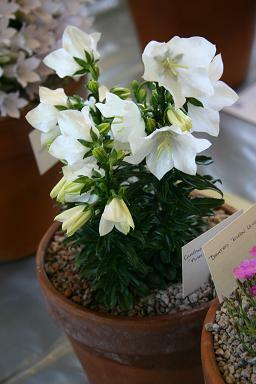 The Alpine Garden Society's Summer Show South, Wimborne. A very beautiful plant for moist shade. 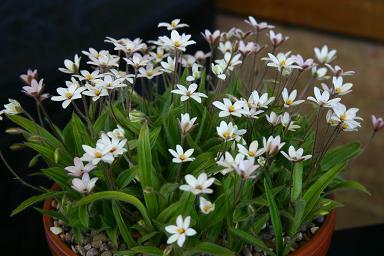 I have just bought a small one, so it was timely to see it growing so well at the show. This is the first time I have seen this fabled plant in the flesh. 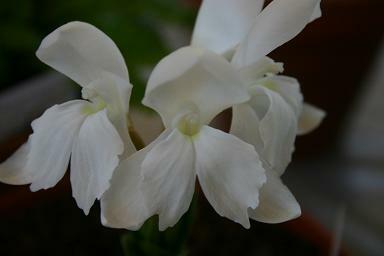 A wonderful pure white flowered form. I grow a seedling from Long Acre Nursery from their plant 'Snowy Owl', but it is pale lilac, so I am in the happy position of having something wonderful to lust after! 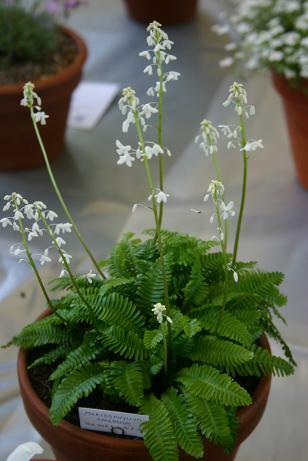 Campanula persicifolia planiflora 'Alba' . I am not generally a lover of Campanula, though I am starting to ammend that view. In general the big ones are too weedy and the small ones are just slug bait, but every now and then I see something truly wonderful. I saw this one at the show last year, and have looked for a source (but not found one). This year, the same plant at the same show is twice as impressive. I grow a few Rhodohypoxis in a very gentle and not at all obsessive way, but they have been so fantastic this year that I have started to look at them a bit more closely. A display at the show have me a timely opportunity to look at a wide range (and I came away with a couple of new ones). This hybrid x Rhodoxis is also pretty impressive.